Bagels were not mainstream when I was growing up in the late 60s and early 70s. But my mother’s best friend was Jewish so I was eating bagels long before they were a popular breakfast food. I was also eating noodle kugel and Goodman’s Noodle Soup and potato latkes, in case you’re wondering. But this post is about bagels. Specifically, Zeppy’s Bagels. 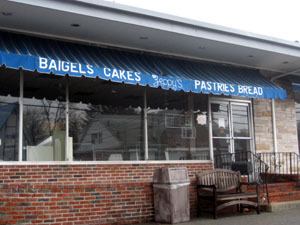 This Jewish bakery has been in existence since 1925 and you can read more about it here. I’d never actually been there myself until I had Dale drive me there the other day to take the photos for today’s post because nowadays you can buy Zeppy’s bagels at the grocery store. But, as I said, you couldn’t buy bagels just anywhere when I was a kid. Or, at least, not good bagels. 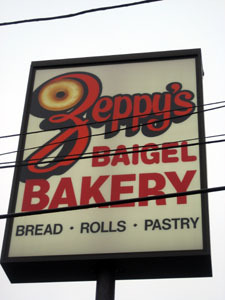 So, on Sunday mornings before church my dad would drive to Randolph and get Zeppy’s bagels. My favorite was onion but I’d settle for egg if the onion bagels were sold out. I liked Temptee Whipped Cream cheese – you know, the one in the pink tub – the best. With lox, please, although that was only on special occasions. And don’t toast it. And you know what? An onion bagel with lox and cream cheese is still one of my most favorite things for breakfast. So much so that it’s what I requested for breakfast on my wedding day. Both times. Ahem. And from Zeppy’s, of course. GREAT post, Carole!! I’ll bring you a kugel anytime — and now I know to add some bagels to the mix. I love that Temptee cream cheese — I usually buy it at Passover and have it on matzah with jelly (the ole matzvah/cream cheese/jelly sandwich). Hey, we buy those! I’ve never been to the bakery but now I want to go! I love onion bagels, toasted with butter though. That was a great “Z”! I’ve really enjoyed your abc-along posts. YAY for real bagels! There is no such thing in Utah…so sad. Oh, nice Z!! I used to be a big fan of garlic bagels. Yum! I love onion bagels, but for me it’s toasted with cream cheese, no lox thanx. They’re pretty good with egg’n cheese, too. Very creative! I remember when bagels were hard to come by. We used to have to drive 25 miles to get them when I was a kid. MMMMMMMM–I love onion bagels–especially good ones! Though as a Southerner I’ve never had Lox but I’m always open to try something new! of course now i want a bagel. Excellent Z. I’m still trying to think of what mine can be. Time is running OUT! I love how “baigels” is spelled on the sign. Awesome! Great post, Carole! Makes me crave bagels. But I’ve never had a Zeppy’s. Imagine?? I went to college in Western NY. After growing up near NYC, I really missed the wonderful bagels we were able to get at home. Once a week our local health food store would get a fresh shipment of bagels from the city. We’d all be sure to get our weekly fix. I’m with you, keep that toaster away from my bagel! Ohhhhh I want a bagel with lox and cream cheese! See, as a Jewish girl with parents from Philly & NYC I grew up eating that. Yummmmmmm. There are few food combinations in this world that can top bagels, cream cheese, and lox. Dammit, now I have to get dressed and go to the bagel shop. Craving…..
Great Z post! My favorite is rasin toasted with cream cheese. Hey, Carole last time I was there it was closed down. I guess it must have reopened! Good news. My favorite is the everything bagel and I’m somewhat of a bagel “maven” as I come from NY and KNOW what a good bagel is, LOL. I agree about the Temptee cream cheese..YUM! Breakfast of champions! Nothing beats an onion bagel with cream cheese and lox. NOTHING. I can’t help wondering if Zeppy is short for Giuseppe. I love multiethnic MA. Also lox and Temptee. Yum. I couldn’t have read this while I was still at home where there is smoked salmon in the fridge. I know what I’m having for breakfast tomorrow, though. What a great story. Zeppys sounds like a great place with great memories. you have to stop with the doing of the thing where you post stuff that makes my mouth water. Yum! Bagels with cream cheese and lox! I never knew what lox was until I moved to Florida in 1980, at which point I became addicted. Not very common here in Oklahoma. Thanks for the memories!! Ooooo now I really want an Onion Bagel… or an Everything Bagel. Toasted and with green olive cream cheese please. I had never heard of Zeppy’s until I met Phil and he took me there. Now Zeppy’s is a treat! Oh, wow. I can taste the ones from Bagel Nosh now… onion bagels, yum! I’m still bummed that my favorite chain in NYC seems to be no more. Sob, sniff. And it’s been gone for a really long time, too. And what the heck happened to Aesop’s Bagels in Lexington? Sunflower seed ones! So great! Getting a good grump on, now. “Both times”…..you do make me laugh…LOL! Yummy Z post! I started eating bagels in college (Lender’s) and got my family hooked. I love them with cream cheese and lox. Plain bagels, mostly, though I like the onion ones too. And if I can’t get the lox, smoked salmon cream cheese (at Dunkin) gives me a fix, too. In response to michelle, Zeppy’s actually used to be owned by my (great) aunt and uncle, Jack and Doris Zeprun. Zeppy was jack’s nick-name. Its too bad you can’t get their old bagels, they used to be absolutly DELISH. Instead of the massive bloated monsters that are served now, they used to have these smallish compact ones, they were great. to bad my cousin ran the business into the ground and had to sell it. They still make the best half-moons around, though. O, and they were jews, haha.